It was all about the public as Marina Abramovic began her sixth lecture – from a series of eight she is delivering as part of Terra Comunal - MAI – calling to the stage Mauricio Ianês, one of the Brazilian artists featured in the MAI Presents program. Ianês’ performance piece The Bond takes place daily next to the “In Between” space at SESC Pompeia. After screening video documentation of The Bond and some quotes by the artist, a series of video testimonials played shedding light on visitors’ first impressions of the performance as they entered the “In Between” space. To Ianês, art is the experience he shares with the public inside that space. The most powerful aspect of this performance, he says, is not something visible or tangible. Viewers’ reactions of both surprise and understanding, the anger and the subsequent peace they released within the performance space, together it was a fitting segue into Abramovic’s lecture topic: the public body. The lecture centered on artwork relying heavily on its audience, whose interactive role is crucial. Examples ranged from Abramovic’s own Transitory Objects, furniture and sculpture made with crystals, to performance pieces by Ianês where he offers his body to the public. 'If I can think of a master, I can only think of Tehching Hsieh. When I asked him after all those years making one-year [long] performances what he was doing, he said: ‘Now I’m doing life'. And that’s so great'. Emphasizing the importance of preparing the public to experience long durational works, she gave an overview of Marina Abramovic Institute, also known as MAI, and described the exercises participants will engage in as part of the Abramovic Method at the Institute building in Hudson, New York. 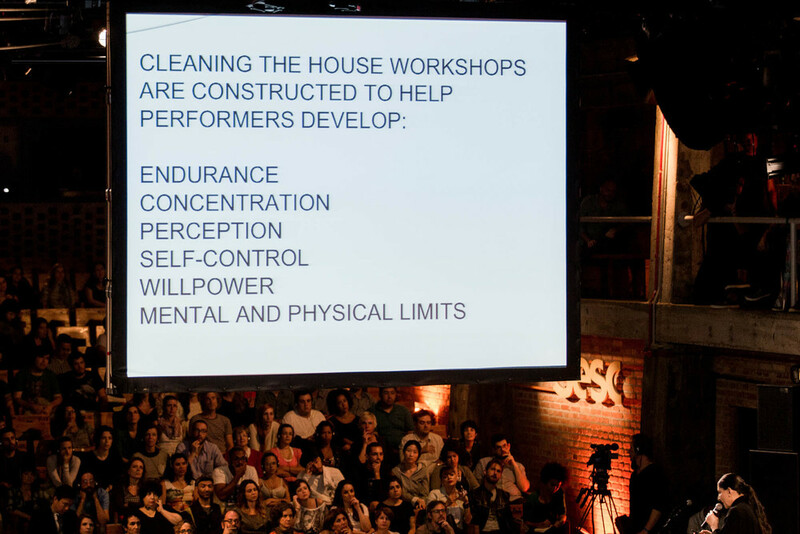 Marina Abramovic's sixth lecture on performance art at Terra Comunal - MAI was held on Thursday, April 26, from 8pm to 10pm BRT at SESC Pompeia's main auditorium. Check our calendar for dates and times of the remaining four talks in Marina Abramovic’s lecture series.